First Line: Since Maria had decided to die her cat would have to fend for itself. Leo Demidov is an idealistic war hero with a beautiful wife. He has an influential position with the MGB-- the State Security Force-- and can even afford to provide an apartment for his parents. All he has ever wanted to do is to serve his country, and with that aim in mind, Leo has arrested and interrogated many, many people. There may be those people who wish harm to the State, but every good Russian knows that there is no actual crime in Stalin's Soviet Union. In a move Leo could never have anticipated, he is demoted, denounced, and exiled from his home with only his wife Raisa at his side. It is now and only now that Leo realizes that there is indeed crime in Russia. That there is a mad man killing the innocent at will. The only way Leo can save his life and the lives of his family is to uncover the killer-- but it is a crime against the State to even admit that a murderer (much less a serial killer) exists. Walking a tightrope doesn't even begin to describe what Leo Demidov faces. 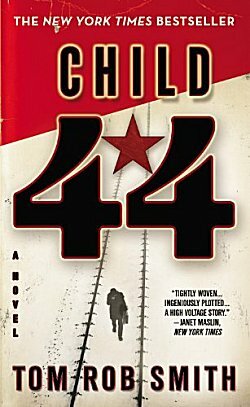 In the words of Emily Dickinson, Child 44 is a brilliantly plotted novel that had me feeling "zero at the bone" many times. From its staggering depiction of Stalinist Russia to the blood-chilling meaning behind its title, Tom Rob Smith's book grabbed me by the throat and refused to turn me loose. The devastating things Stalin's government did to the minds and bodies of its people almost beggars belief, and I have to admit that I did read this book in small sips until about the two-thirds mark simply because I wasn't quite in the mood for such a depressing book. The sips may have been small, but they were very frequent because Smith knows how to tell a tale, and once Demidov's investigation hits its stride, there was no way I could put Child 44 down. However, this isn't merely a nose-to-the-window depiction of an era and an absorbing murder mystery. Smith's characterization is superb. Through the course of the book, Leo Demidov loses his innocence and grows up. His wife Raisa later shows depths undreamt of when readers first met her. The differences between city folk and country folk give readers hope for humanity, and there's a little girl named Nadya, who was probably my favorite character in the entire novel. Tom Rob Smith's Child 44 made me say "Wow!" more than once while reading it, and I'm certainly looking forward to continuing Leo's story in the rest of the trilogy. Isn't this a powerful novel, Cathy? I really liked the sense of atmosphere, along with everything else. And I agree: there are some strong and powerful characters here. Child 44 is a fabulous book...so glad you 'enjoyed' it (hard to think of enjoyment and that story but you know what I mean). I won't give advice...you're a big girl and can decide for yourself...but if I had my time over again I would leave this as a standalone read. I did not think the two follow-up books were a patch on this one for story, character development or nuance. I would guess (but have no knowledge) that the second one (The Secret Speech) was rushed to publication due to the presumably unexpected success of Child 44 (it was longlisted for the Booker Prize from memory - that cannot have been anticipated). Whatever the reason it was a poor imitation of its predecessor - like the literary equivalent of a Michael Bey movie for me - nothing subtle or thoughtful or insightful about it. The final books was OK but nothing really memorable. I think I'm probably going to follow your advice, Bernadette, since it follows some of my own research in preparation to buy the books.